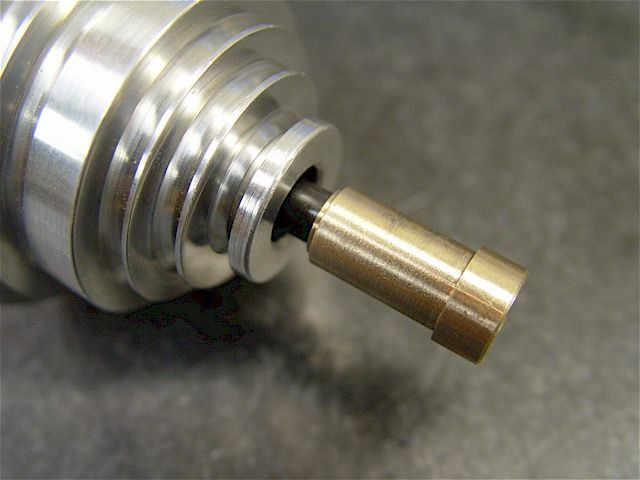 WARNINGS: Spindle accessories must be wrench tightened before using in forward or reverse to prevent them from spinning off. The 3-jaw chuck jaws can loosen & fly off the chuck if spun-up without them being clamped onto a part. 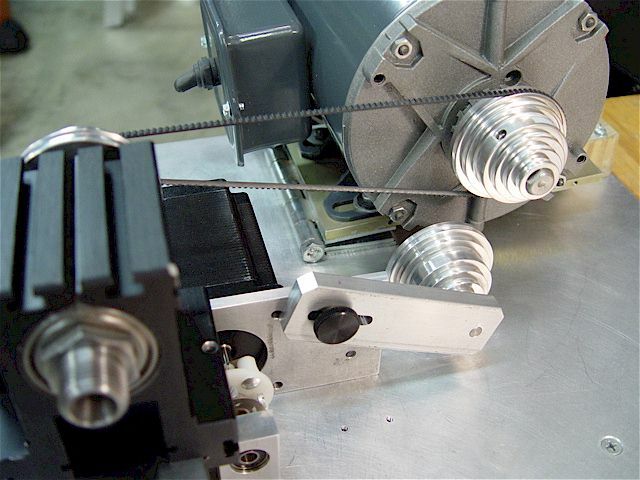 Motor belt tensioning animation. Note how the clamp pushes the plate down 2mm. Taig Lathe manual. Caution: Only use a motor that is either non-thermally protected or has a thermal overload circuit that requires manual reset. 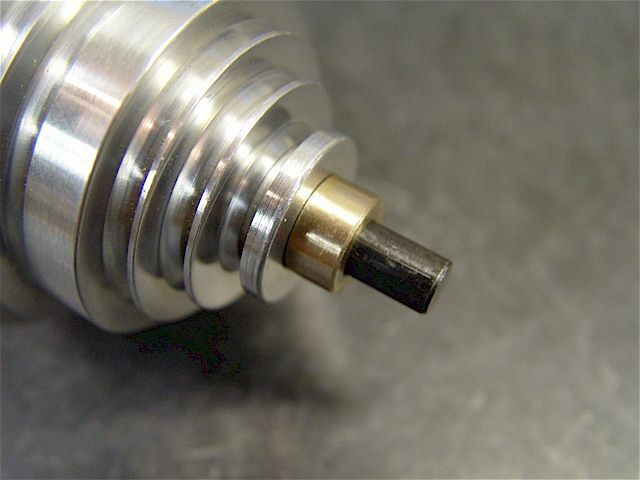 unexpectedly start-up again while you are touching/changing sharp end mills, saw blades, pulleys or other rotating parts. mounted onto a plate, in-turn held by a large, galvanized door hinge. Generally, these hinges are loose so it was drilled out & a close-fitting bolt with nut was installed. abrasion that could occur from repeatedly pivoting the motor over time. The sealed motor is impervious to metal debris. 1/4-HP is considered by Taig to be the maximum size. By comparison, this 1/4-HP motor is 50% stronger than a 1/6 HP motor & 250% stronger than a 1/10 HP motor. 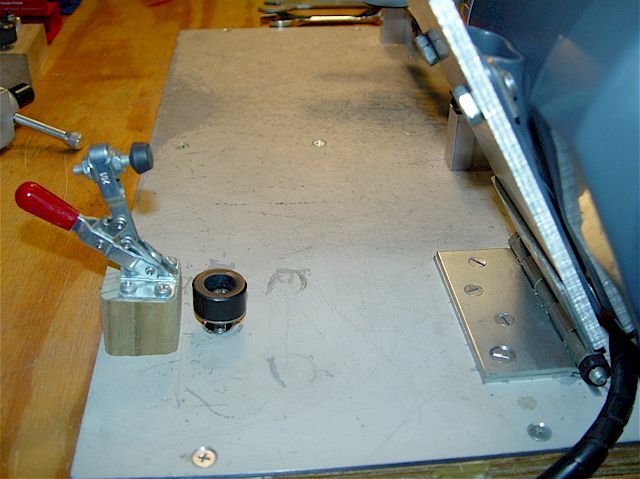 Mounted to the left (CCW rotation) provides additional work space behind the lathe bed. OFF (switch up). Make sure to properly ground the circuit. due to its locking mounting plate arrangement. This suggested the addition of the hold down action clamp. 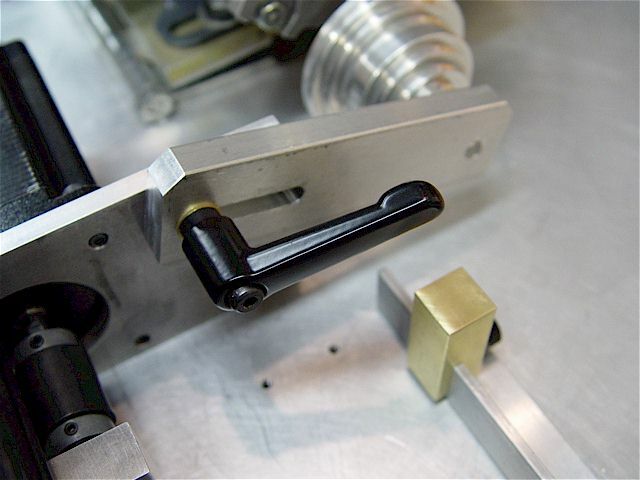 In order to eliminate vibration & increase belt tension, install a vertical hold down action clamp. the motor mounting plate is then captured between the upper & lower adjustable rubber-ended stops. Belt tension can now be increased when turning larger pieces. Runs very smoothly & with high V-belt traction. 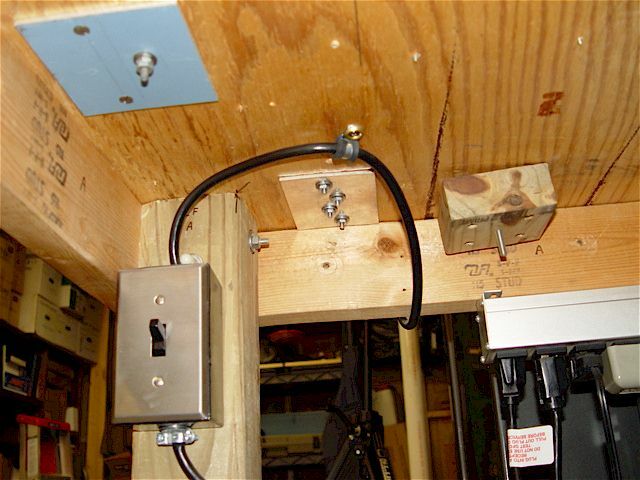 Under the bench power switch arrangement. Note the (blue) lathe mount reinforcement plate. towards the direction of rotation. The wiring schematic is on the motor ID plate. A rubber boot keeps out debris. 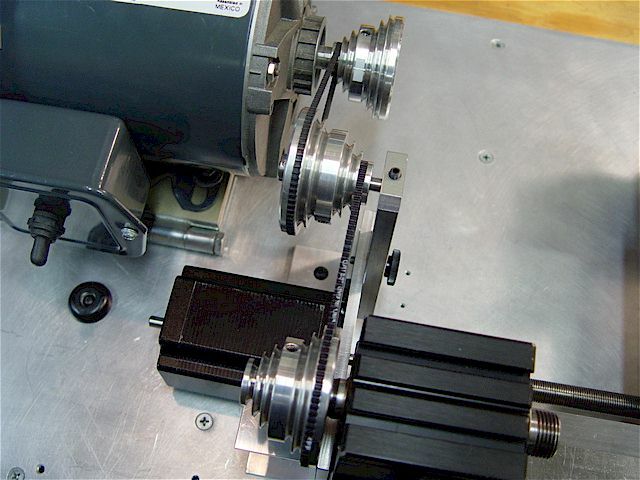 Lathe speed-reduction pulleys are called jackshafts or countershafts. This design is very sturdy & compact. 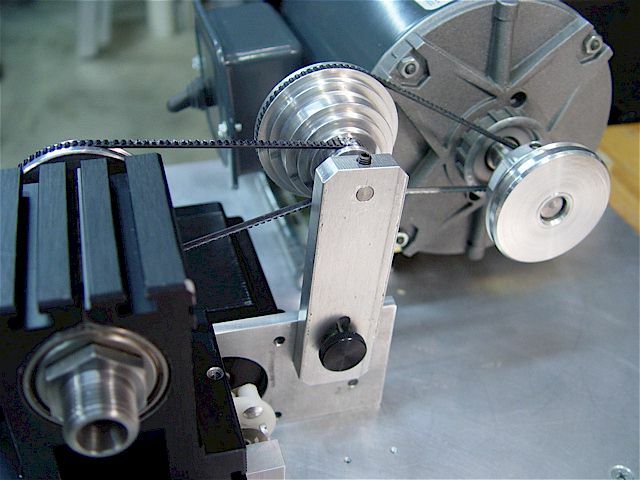 Added a 3rd, intermediary pulley, yielding a 10:1 motor to spindle reduction producing a low 178 RPM. 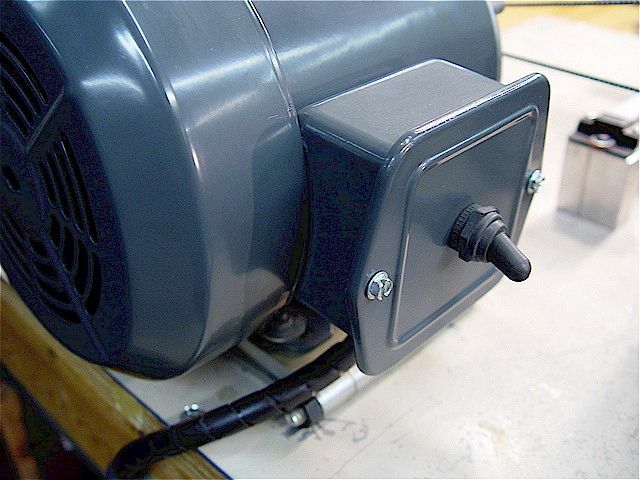 The 3/8" thick arm has vertical height & pivot adjustments using a 10-32 thumb knob in a machined slot. 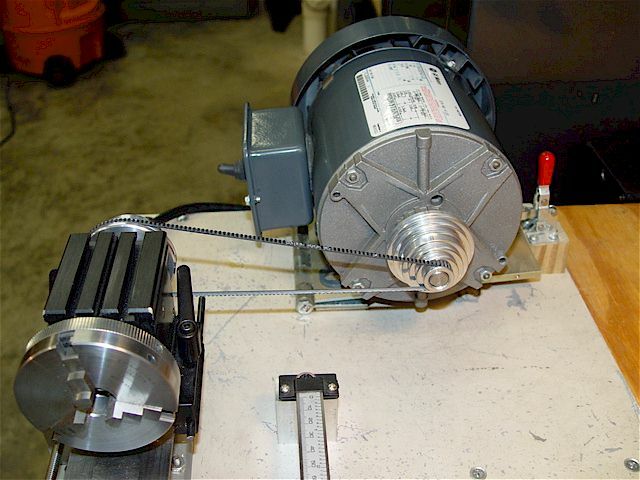 It is mounted onto the extended stepper-motor bracket making an overall strong, rigid arrangement. The axle is in a precision reamed 1/4" bracket hole & held in place using a 10-32 nylon-tipped set screw. Note the rubber bumper (left) that the motor rests against when pivoted forward to change pulleys/belts. Two, Taig mill belts (12.5cm flat length) & another Taig pulley were used in the modification. 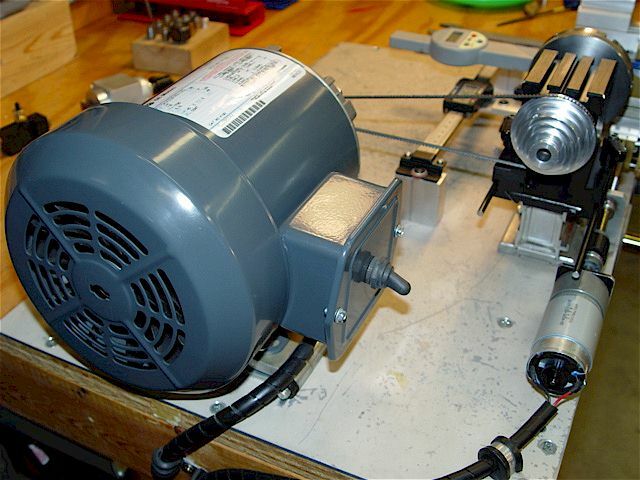 The 305 in-oz lead screw stepper motor is tucked in close & out of the way; everything clears. 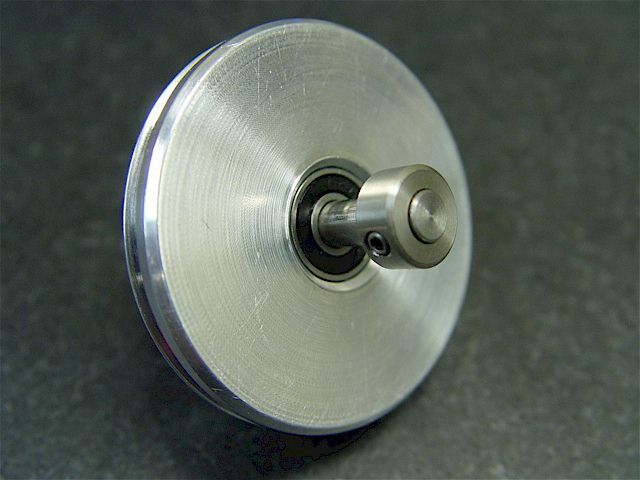 This design was also used for the Taig mill speed-reduction pulley modification. (or removed), the motor pulley is removed, flipped 180 deg & reinstalled, then the longer OEM belt is installed. 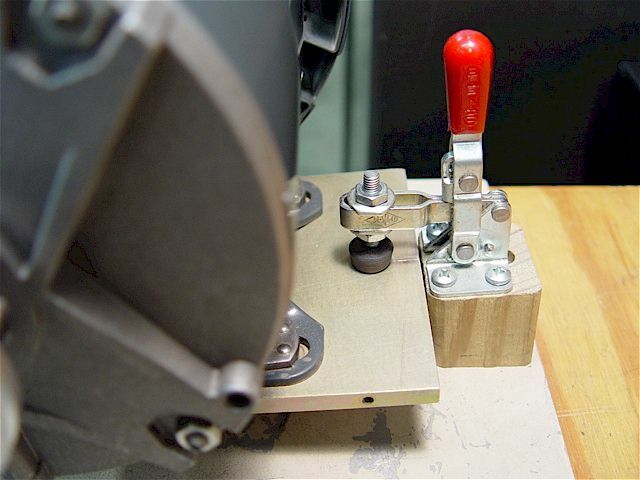 The knob has since been replaced with a die-cast zinc ratcheting locking lever for tighter clamping. One of the 3rd pulley bearings is exposed by pulling the axle out. made to an interference fit tolerance thereby requiring it to be first heated before installing the bearings. Inside, in-between the bearings, on the 1/4" SS axle, there is a thin metal tube spacer that contacts the hubs. The steel collar with set screw also has a small ridge that only contacts the bearing's hub. 3/8" pulley hole area. 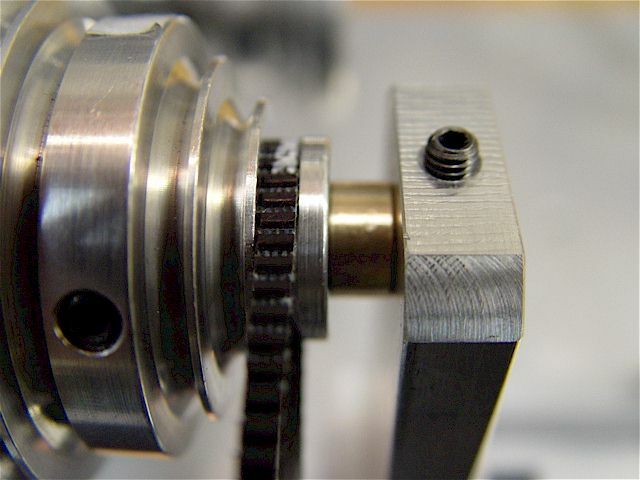 The 0.318" diameter ridge (left) allows only the edge to contact the inner bearing hub. A 1/4" collar acts s a spacer & another (third) thrust bearing. 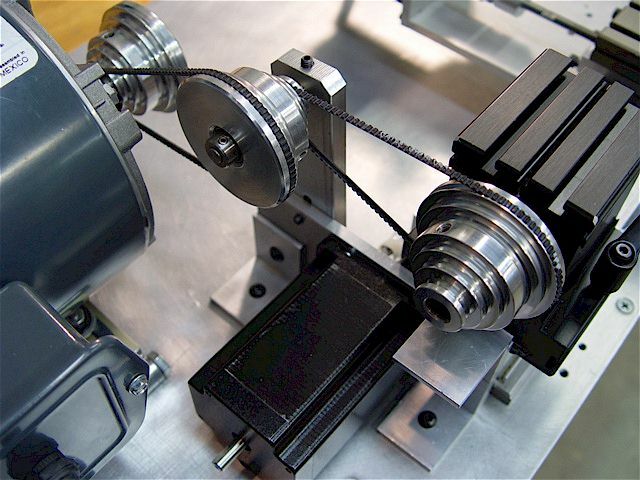 high belt tension & the RPM is rock solid. The bearing has white lithium grease as an additional lubricant.